Bear garlic, a favored herb among wild bears, is known to treat ailments like high cholesterol and high blood pressure. Learn more about its history, characteristics, and varied uses. Revered for its blood-cleansing properties, bear's garlic is one of the oldest and most popular medicinal herbs among animals and humans alike. As legend would have it, bear's garlic was named for its apparent attractiveness to brown bears living in the plant's native region of northern Europe. Because it was often the first source of food available to them after their winter hibernation, the delicious herb is believed to have restored their vitality and strength. Read on to learn more about bear's garlic and its present-day uses below. Treating high blood pressure. Antiplatelet activity in bear's garlic is responsible for thinning out the blood and reversing hypertension. Supporting immune system activity. Thanks to potent antimicrobial action, bear's garlic helps to fight off bodily infection, and can be used to recover from the common cold. Lowering high cholesterol levels. Bear's garlic lowers blood lipids to help prevent age-related cardiovascular disease. In addition to these main benefits, research indicates that regular treatment with bear's garlic can help to detoxify the body and ease gastrointestinal problems. It is a heart-healthy herb known to improve circulation and reduce the risk of developing cardiac arrhythmias. Although it is composed of a long list of natural substances, bear garlic's sulfuric compounds, phenols, and steroidal glycosides are among its most medicinally-active components. The herb is comparable to common garlic in many regards, except some studies suggest that it might hold even more concentrated levels of garlic's active ingredients. Bear's garlic and its chemical mechanisms are still being investigated. Nearly 20 times higher in adenosine, and with twice the normal content of ajoene when compared with other Alllium species, bear's garlic interacts with calcium and potassium channels to promote blood vessels' dilation and inhibits coagulation. Other herbs with cardioprotective properties are burdock and olive, while cherimoya and chili pepper also help reduce cholesterol levels. With no serious side effects, bear's garlic is mostly safe when consumed as a food crop. In special cases, however, it may cause allergic reactions in sensitive individuals. People with known sensitivities to garlic, onions, leeks, and shallots should avoid taking bear's garlic. Breastfeeding women, children, and expectant mothers are likewise discouraged from its use due to a lack of clinical testing across these demographics. Bear's garlic is a blood-thinning herb that increases the likelihood of bleeding when taken with warfarin or other anticoagulant drugs. Containing the highest known levels of sulfur and adenosine in the plant kingdom, bear's garlic is most commonly substituted for regular garlic in cooking. The leaves of the plant are also edible, adding flavor and pizzas, salads, pastas, and pesto sauces. The bold, oniony taste of fresh bear garlic bulbs also makes them attractive as boiled vegetables in hot soups. Every part of the bear garlic plant holds medicinal value. Commonly ingested as a capsule or liquid extract, remedies made from bear's garlic contain its powerful, concentrated ingredients. Decoction. Often overlooked in medicinal preparations, the stems and bulbs of bear's garlic can be boiled to obtain a concentrated liquid, which can be taken orally in order to regulate blood pressure and boost the immune system. Tincture. Ingesting about 30 - 60 drops of bear garlic tincture twice daily can provide the body with all it needs to recover from illness. Capsules. Capsules are stuffed with the dried leaves of the bear garlic plant to provide a consistent dosage of cholesterol-lowering herbal treatment. Bear's garlic is not as popular as common garlic and is largely absent from major grocery stores and supermarket chains. Other than foraging in the woods, it's possible to find the herb at some farmers' markets as well as reputable plant nurseries and online. If specific plant parts are desired, it may be worth contacting local farms and other home growers in the area. A number of herbal bear garlic supplements exist on the commercial market for alternative medicine. The most popular include powdered leaf capsules and tinctures, which are available for purchase at many pharmacies and specialized health stores; however, big online retailers carry most bear's garlic products. Bear's garlic is a low-maintenance, easy-growing herb that is best cultivated in temperate zones. The following guidelines will help to ensure that growing bear's garlic is an easy, stress-free experience for gardeners of all skill levels. Like its close relative common garlic, bear's garlic thrives in cool weather, and is most commonly planted during the fall so that it can have the entire winter to start developing its root system. While it tolerates a range of pH levels, bear's garlic prefers slightly acidic soil between 6.2 and 6.8. Bear's garlic grows best in sandy, well-drained loams, which protect the plant from waterlogging. Bulbs are planted directly into the ground, spaced at about 6 inches (15 cm) apart in neat rows. Bear's garlic is susceptible to several pests and diseases, including onion flies, thrips, white rot, mildew, and fungal leaf spot. Thus, good cultivation practices and quality pest control are required to help manage these problems. Bear garlic leaves and flowers can be harvested each spring. Meanwhile, the bulbs can be dug up every summer and replanted for growth in the new season. Bear garlic can be found growing in the wild in damp forest landscapes in Europe and Asia. Reaching an average of 12 feet (3.7 m) tall, bear's garlic is characterized by an onion-like root that sprouts a long stem with two shiny leaves. From April to June, the plant bears a white flower that gives off a garlicky scent. Bear garlic is part of the large Amaryllidaceae family, represented by 59 genera and over 850 species all over the world. As a member of the Allium genus, bear's garlic is closely related to herbs like onion (Allium cepa), garlic (Allium sativum) leek (Allium ampeloprasum), and chive (Allium schoenoprasum). Its botanical name, Allium ursinum, is derived from the Latin ursus, meaning bear. 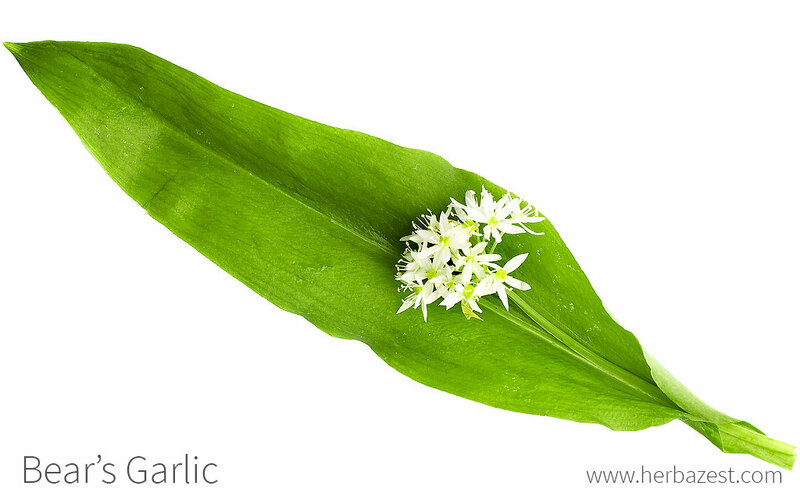 According to the smoothness of the pedicel surface, there are two commonly-recognized subspecies of bear's garlic: A. ursinum subsp. ursinum and A. ursinum subsp. ucrainicum. While the former seems to be indigenous to western and central Europe, the latter is distributed in the eastern and southeastern parts of the continent. Nowadays, bear's garlic is cultivated all over the world. However, it is very commonly mistaken for the poisonous lily of the valley plant (Convallaria majalis), whose leaves closely resemble bear's garlic before flowering. Bear's garlic boasts a very long history of use. The 1st-century Greek botanist Pedanius Dioscorides mentioned it in his five-volume herbal encyclopedia, touting its efficacy for the cleansing and detoxifying the body. During the Middle Ages, King Charlemagne of present-day France catalogued the plant in his Capitulare de Villis imperialibis, a guide that highlighted the medicinal properties of common herbs. In 1992, bear's garlic was named Plant of the Year by the Society for the Protection and Investigation of European Flora. Although easily overshadowed by its more lucrative relatives, bear's garlic still holds the same wonderful health benefits that initially earned it the esteemed title. Gardening. Bear's garlic showy white flowers make it an excellent addition to the gardenas an ornamental. Fodder. Sometimes, it is even made into fodder for cows to impart new flavor to milks, butters, and cheeses. Offering delicious new possibilities for food and healthcare alike, bear's garlic is an extremely useful plant with lots to offer. No wonder, then, that it is now widely cultivated outside of its native range, and is a beloved garlic's substitute in many culinary preparations.